She has seen the members of the Singing Kettle performing on stage wearing headsets to amplify their voices and seemed to like the idea of looking like a performer. We tried out the Toobaloo first and Daisy remarked “I like hearing my voice.” We are currently enjoying reading books to each other. I model first and she follows with her version. Using the Toobaloo allowed Daisy to concentrate on her book even though Rose was chatting away very loudly beside her. Later I was surprised to hear her using the Toobaloo with a loud voice so we sat down and played with whispering and humming a tune to emphasise she did not need to use a loud voice. Rose also liked the Toobaloo. She initially used it as a telephone, and then noticed how she could hear her voice. Pleased as punch! The whisper phone was also a hit. Immediately Daisy reduced her volume and enunciated more clearly. Her pose with attitude! 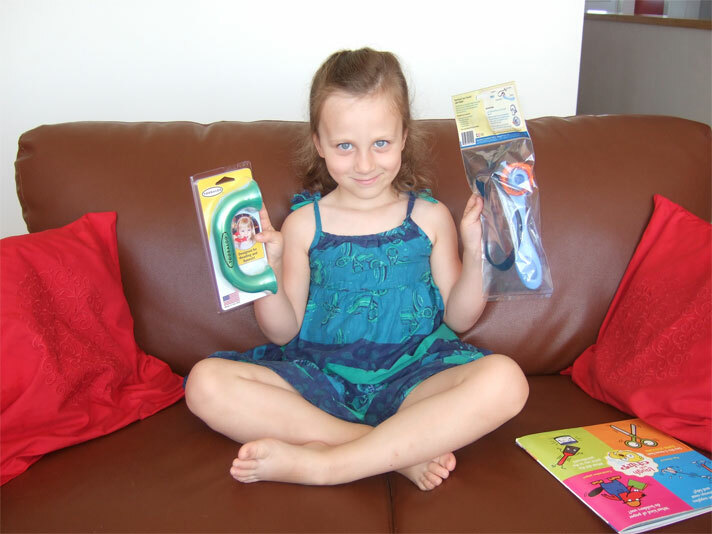 She liked both products and when asked to choose her favourite she chose the WhisperPhone; “This one because you don’t have to hold it”. I can see the benefits of both products as a mom and a teacher. The Toobaloo seems more suited to younger children and I loved the break-resistant plastic (a must with a 13 month old around!). The WhisperPhone is designed for K- Gr 4 although it did adapt to Daisy’s head well. The hands free ability will suit older children who are reading and working by themselves. Children can hear themselves read even if the classroom is busy (noisy). Practice writing: children can reread and edit their writing, clearly identifying where improvements can be made. Reading and rereading for performance. I am an English teacher in Taipei. Tell your daughters “Thanks” for the fun article. I would like to have the parents of my students read your article… If you are interested I can send you an official Chinese translation via email… ??? You are very welcome to have the parents of your students read this article. I am glad you enjoyed it. We just saw this item on our children’s school supply list for this upcoming year and are quite excited about this item. Thanks for sharing.